I never wrote anything about the two landmark decisions from the Supreme Court of Canada last year – despite the fact I wrote several posts about each, as they were working their way up on appeal. And while I have a lot to say about each of them, I figured I’d just drop a quick note about the Keewatin, aka Grassy Narrows opinion (http://www.canlii.org/en/ca/scc/doc/2014/2014scc48/2014scc48.html?autocompleteStr=grassy%20nar&autocompletePos=1). At the outset, I have a much rosier view of this case than most people. Right out of the gate, the decision is a clear loss for the First Nation and it completely overturned the Court’s existing caselaw on treaty rights and interjurisdictional immunity (IJI). I also should say I more or less agreed with the trial judge and thought the Ontario Court of Appeal decision was horrible. It was. Notwithstanding my views on the merits, I hoped and fully expected that the SCC would do ‘something’ about IJI in these cases. First and foremost, and I really can’t stress this enough, the case comes in at a thin 55 paragraphs. Compare that to Delgamuukw (209 paras), Van der Peet (322 paras) or even Tsilhqotin (153 paras, but pretty brief compared to an appellate decision of 346 paras and a trial decision consisting of a whopping 1382 paras). I’m a big fan of brevity because it seems to reduce the ambiguity in what the court is holding, and more important, why. What is IJI (besides something which vexes law students)? It’s about jurisdiction. Under the Constitution, there are some matters which are allocated to the provinces and some to the federal government. Those matters are mostly listed in sections 91 and 92 of the Constitution Act, 1867. IJI simply means that one level of government may not legislate on a topic allocated to the other level. Of course, all these areas are inter-related – so what you learn in law school is how to figure out when a level of government is meddling in another government’s jurisdiction. As luck would have it, “Indians, and lands reserved for the Indians” is allocated to the federal legislature. What does that mean? It means if anyone can exercise legislative power over “Indians, and Lands reserved for the Indians”, it’s the federal Parliament – and only the federal Parliament. Any exercise of provincial legislative power which is held to be about “Indians, and Lands reserved for the Indians” is an illegal exercise of legislative power. Neither of these cases mentioned a treaty rights case from just a year before, called R v. Morris (http://canlii.ca/t/1q64k). That case involved the successful application of IJI to a treaty hunting case, ousting provincial legislation which interfered with that treaty right. At the time, I was completely confused by the 2007 banking cases. They seemed to suggest that IJI was all but dead, except in treaty rights cases, maybe. Morris wasn’t overruled in those cases, in fact it wasn’t even mentioned. This bothered me for quite some time, as its difficult to see why IJI should be preserved in the context of 91(24), and not anywhere else. To be really technical about it, even the distinctions where IJI is forcefully applied – or not applied at all – within 91(24) jurisprudence was already fairly unprincipled…and confusing. There are those who would say that 91(24) offers First Nations rights ‘protection’. Remember that 91(24) is about jurisdiction: it’s not about whether the Crown can infringe on aboriginal rights, its about ‘which Crown’ (after this case, maybe ‘which government’) can infringe such rights. Section 35 and arguably some parts of the Charter are the constitutional provisions which offer protection for aboriginal and treaty rights. While I recognize there is a pretty steep conflict of interest for a province to be responsible for exploiting the same natural resources protected by treaty (of course, there’s also pretty strong incentives to be in treaty, as well), I’m not sure why that conflict shouldn’t be managed through the protections of s. 35, rather than the jurisdictional provision of 91(24). And indeed, that’s exactly where the SCC went in both Tsilhqot’in and in Grassy Narrows. I’m well aware its an unpopular position to take, but I really don’t have much of a problem with that. 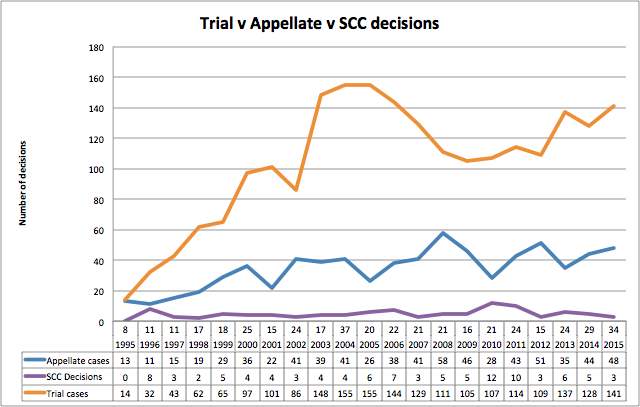 In fact, I think the SCC really did First Nations, legislatures and the Crown a major favour by going in this direction. That’s despite my own caveats about First Nations jurisdiction (still invisible, and a major problem that it is). Whether you like them or not (and I suspect on Grassy Narrows many fall into the ‘not’ group), the Court’s decisions in Tsilhqot’in and Grassy Narrows dramatically reshape the doctrine of interjurisdictional immunity. The Court noted that the Trial Judge in Tsilhqot’in relied on the Morris case, a case which came out before the Court’s decision in the banking cases. What they left out was it came out, like, months before those cases. At this point, I might’ve been reading someone really just raging on the Court’s…erratic findings on IJI and section 35 rights. For example, at paragraph 138, the Court pointed out, “The ambiguous state of the jurisprudence has created unpredictability. It is clear that where valid federal law interferes with an Aboriginal or treaty right, the s. 35 Sparrow framework governs the law’s applicability. It is less clear, however, that it is so where valid provincial law interferes with an Aboriginal or treaty right. The jurisprudence leaves the following questions unanswered. Does interjurisdictional immunity prevent provincial governments from ever limiting Aboriginal rights even if a particular infringement would be justified under the Sparrow framework? Is provincial interference with Aboriginal rights treated differently than treaty rights? And, are commercial Aboriginal rights treated differently than non-commercial Aboriginal rights?“ The only thing missing was the once obligatory reference to s.88 of the Indian Act (don’t get me started). It’s pretty gutsy and its pretty extreme for the Court to reflect on its own jurisprudence in this manner. It’s also pretty welcome, for my part, because it had been becoming increasingly difficult to make sense of IJI jurisprudence. Even more interesting, the court picked up on the point that IJI is not about whether one may infringe a right, but rather about whom may infringe. Analogizing to Charter rights, the court noted section 35 rights “are held against government — they operate to prohibit certain types of regulation which governments could otherwise impose. These limits have nothing to do with whether something lies at the core of the federal government’s powers.” (at para 142 of the Tsilhqot’in case). I have my own minor issue about this passage, basically wondering whether section 35 also requires certain types of Crown conduct. It clearly already does, in a range of circumstances. Instead of worrying about whether the appropriate level of government is violating the rights of aboriginal peoples, the Court seems more interested in whether those rights are actually being violated. This eliminates a pretty powerful argument which First Nations have used to successfully strike down provincial laws, but it also means provinces have a much more central role to play in fulfilling the Crown’s treaty promises. I`ll expand on that in my next post. This column is a response to Russell Diabo’s excellent and powerful commentary on why First Nations persons should not vote in the upcoming federal election (https://ricochet.media/en/534/first-nations-and-the-federal-election-an-exercise-in-self-termination) . In the end, I agree with Russ’s analysis and I’ll articulate why below. Before that, though, I think its worth pointing out that how people can justify taking a rights-based approach to First Nations issues, while still voting in federal elections. It’s also a reaction to the shock and mild amusement I got from National Chief Perry Bellegarde calling for First Nations persons to vote in the upcoming federal election, while noting that he himself has never voted (http://www.cbc.ca/news/politics/canada-election-2015-assembly-first-nations-bellegarde-1.3212551). He cited a pretty extreme view of non-partisanship (even civil servants, who must be non-partisan, vote – though singing songs about it is a bit more of a grey area). This led me to a question: Can you vote, seek to advance indigenous rights and still sleep at night? I see the law as little more than a series of discursive tools. And since I’m a serial contrarian, so I’ll take on the counterpoint – that it may be OK for some persons to vote. At the outset, I will say that voting does require one to acknowledge one’s own Canadian citizenship. This is a bridge too far for a lot of persons and a lot of peoples. For example, particularly for some peoples, it can be very difficult to come up with a meaningful legal reason why indigenous peoples are subject to Canadian law. If you adhere to such arguments (which, again, are perfectly good), then I’m not sure it is possible for you to vote and still sleep at night. The fundamental issue often raised by those who claim that First Nations persons shouldn’t vote is that in doing so, they are recognizing Canada’s sovereignty and implicitly, undermining the sovereignties of their own nations. This is a pretty powerful argument, especially to the extent indigenous peoples maintain and advance positions founded in sovereignty. Does it undermine the sovereignty of one nation to participate in both its elections and in the elections of another nation? It seems some people object to voting in Canadian elections on the basis that it does. Is that assumption valid? It might help to look to examples in international practice to find out. As luck would have it, there are likely thousands of persons in Canada and many thousands more worldwide, who find themselves in this very position. Dual citizens may already vote in multiple countries. Dual US-Canadian citizens, for example, can and do file absentee ballots to vote in US elections. In fact, some countries, such as Italy, have even built entire ‘overseas constituencies’, likely made up of some number of dual citizens! That means there is somebody sitting in the Italian Parliament right now, representing Italian citizens (including Italian-Canadian dual citizens) from the Americas. Dual citizens of any combination of the United States, Italy, France and Canada (even with its new restrictions), as examples, are not any more or less loyal to their countries for voting in any elections (whether they are resident in a country or not). More important, it simply does not make a country less sovereign to allow dual citizens to vote. What does this have to do with anything? Everything! Say you are from an indigenous nation in treaty with Canada and you believe that treaty explicitly recognizes your nation’s sovereignty (it does, by the way), as well as Canada’s sovereignty. A true ‘nation-to-nation’ relationship, as contrasted to a purely domestic arrangement providing some degree of autonomy for your nation within a broader Canadian state (that might be called suzerainty, a term which is not in fashion these days). Well, then, you might consider yourself a dual citizen of your nation and of Canada – two equal and independent states, no different than being a dual citizen of Canada and, say, Italy. All of a sudden, it might not look so bad to be voting. It doesn’t take anything away from your own nation’s sovereignty, and whatever happens in Canada’s elections, including how Canada itself deals with your nation, is probably quite relevant to you. It’s quite true that the government of Canada, Canadian political elites and Canadian courts wouldn’t share these views. I’d say it’d even be a stretch to gain political or legal recognition out of the Canadian system (especially the political system) for meaningful autonomy. And again, I have to stress that there exist indigenous peoples in North America who hold treaties which guarantee exactly the opposite: rather than integrating indigenous peoples into a broader sovereignty, they explicitly recognize that full indigenous sovereignty continues parallel to state sovereignty. In fact, I could go so far as to suggest that persons from nations with such treaties could actually be violating their own treaty promises by voting in Canadian elections. I really hate to break this to people, but a lot of us are already trying to influence Canadian law and policy. One pretty effective means for influencing law and policy in a democratic country is through electoral politics. Even some of those who are not voting are likely inclined to share their opinions regarding where Canada is getting it wrong. For some, there is a world of difference between expressing your opinion, voting, providing money to a political party and joining a political party. Some of these, such as expressing an opinion, can be done by anyone. Voters have to be citizens (and possibly resident, I guess), I think only residents can donate and I have no idea what kind of restrictions there are on joining a political party. All of these activities rest on a spectrum of political engagement. For others, these are all merely tactics on a spectrum of trying to influence a government – whether you see that government as foreign or domestic. I’m pretty sceptical of claims floating around that the First Nations vote could influence 51 ridings. Seems to assume all First Nations persons would vote strategically and all would vote for the same candidate. I think the number of ridings capable of being meaningful influenced, at least directly, by the First Nations vote, is much lower. Even worse for all those supporting a particular party – the aboriginal MPs who won in the last election were split all across party lines. Which means if you’re thinking the aboriginal vote is going to oust the Conservatives, you may be mistaken. According to this article, 5 of the 7 aboriginal MPs elected in the 2011 federal election were from the Conservative Party http://www.thestar.com/news/canada/2011/05/03/7_aboriginal_mps_elected.html). Incidentally, I believe this past Parliament may have had more aboriginal MPs than any previous one. That should highlight the limits of relying only on electoral politics to advance change. But First Nations, Inuit and Metis persons exercise considerable political influence in this country, not just because of the number of voters, but because other voters actually care about aboriginal issues – or at least what aboriginal persons think about other issues they care about. That may or may not influence individual voting choices, but it can have a pretty profound impact on public debate during the election period, which can actually translate into some kind of policy action in the ensuing government. Russ’s article is excellent in that it provides a very strong caution to those who think participating in elections is a particularly powerful tool to advance aboriginal rights. It isn’t. He tried that once, and did (I think) a pretty good job of influencing a party platform and raising the profile of aboriginal issues in electoral politics. I’d say he (and others, I should add) also did an excellent job of demonstrating the limits of electoral engagement. A Claim Delayed (in Alberta) is a Claim Denied. Period. The case is Callihoo v Canada (http://canlii.ca/t/gjrhg). It’s hard for me to tell whether this is a test case or just an example of the Crown attempting to clear out some possibly vexatious litigation. It smells to me like a test case. The heart of this very short decision is an attempt by Canada to invoke Rule 4.33 of the Alberta Rules of Civil Procedure. The rule more or less states that an action may be struck if there are no significant developments in the litigation in 3 years (The Court helpfully reproduces the rule at paragraph 20). I’m no expert in civil procedure – I know Ontario, for example, has a rule about delay, but that has substantially different criteria (meaning it’s a totally different rule in Ontario) than Alberta Rule 4.33. First Nations litigation is often long, expensive and complex. I would expect that in most (in fact, in almost all) cases both First Nations and the Crown would consent to delays for any number of reasons. I mean, if I was asked for such consent, I would generally consider it professional courtesy to provide the consent. Unless I had reason (and pretty good reason, with some kind of evidence) for believing the delay was being requested in bad faith. The reason is I wouldn’t want to look like a jerk in front of the court for denying my colleagues the opportunity to put forward their best case. That reason, by the way, holds no matter which side of the aisle one is sitting on. And just to be clear, 4.33(1)(a) expressly allows counsel to consent to avoid a ‘dismissal for long delay’. So when I saw this case, I had to assume there was some pretty egregious conduct – that is to say, some pretty extensive delay – which led to this motion. The record on First Nations actions (or lack thereof) to advance this case can be found at paragraph 8. There are two substantial points here. First, the Court found that issuance of a Notice of Constitutional Question (NCQ) “is similar to a “housekeeping activity”” (para 34), meaning it does not significantly advance the action. Something for First Nations counsel pursuing cases in Alberta to keep in mind for the future. Second, it seems clear that the First Nation changed counsel during the relevant time period. I suspect this isn’t uncommon and its really worth it for First Nations to consider how litigation is going to be managed if their counsel withdraw (or are fired, its unclear what happened here). The record notes that Counsel for the First Nation withdrew in December 2011. The next action noted in the record is one undertaken by one of the Plaintiffs themselves. This is important itself for two reasons. First, change in counsel is one of those situations where one would reasonably assume that a delay is warranted (and grant consent). New counsel must familiarize themselves with the file and with the client (including client expectations). In a complex case (most First Nations cases are complex), this can take quite a bit of time. I’m actually a little bit surprised Canada didn’t grant consent – though it may be nobody asked for it. The second point follows from the first. There is no record offered which identifies notice that new counsel had been retained by the First Nation. In fact, the NCQ was filed by the plaintiff. In other words, it looks like we may have an ‘self-represented plaintiff’ issue here. Self-represented (sometimes referred to as unrepresented) plaintiffs should flag a number of issues for attorneys and courts. One can’t assume that self-represented plaintiffs are familiar with the rules of civil procedure, with the relevant precedents or with the nuances of how to prosecute an action, generally. Indeed, many jurisdictions have specific rules of professional conduct specific to dealing with unrepresented parties. Those rules don’t always apply to litigation. Here, it seems pretty plain that the plaintiff wasn’t terribly sophisticated – the Court noted he served his NCQ on the wrong party (on the province, even though the province had been excused from the action). But it just appears to be a pretty sharp (as in ‘sharp practice’) maneuver to proceed with by invoking Rule 4.33. While it might seem unfair, the Court pretty clearly outlined the harsh application of this rule in other circumstances (at paras 22 and 23). After a quick analysis of the Honour of the Crown as it relates to litigation (a mercifully quick analysis of this point at para 37), the Court dismissed the action (with costs!). It would’ve been nice to have the Court reflect on the merits of proceeding against an unrepresented plaintiff. Having said that, it does appear that counsel was retained to deal with this motion, so this appears to have been an issue only during the 3-year time limit mandated by the Rule. The apparent ability of the plaintiffs to muster counsel to fight this motion, but not to move the action forward may be the reason costs were awarded here (I think its still a little harsh). As I said at the outset, this reeks of a test case. The facts are particularly tilted in favor of the Crown. The Crown was facing (during the relevant time period) an apparently unsophisticated plaintiff (since they served the wrong ‘Party’) and the available precedents on the Rule suggest that dismissal is mandatory. The case is Matsqui First Nation v. Canada (http://canlii.ca/t/gklpc). The issue is how far will the federal Crown go to avoid having to actually discuss rights-based issues with First Nations? Actually, I think case better illustrates only one of many serious barriers to settlement which exist for First Nations claims. This interim decision deals with a federal request to be excused from a court-ordered mediation process. The underlying claim seems relatively straightforward: it appears that Matsqui is seeking a declaration of an aboriginal right to fish; that the Crown was wrong to deny the Matsqui fishing licenses during one season; and damages. Damages may seem odd to some readers, though I would point out that the Sparrow case held that the availability of ‘fair compensation’ is relevant to a justification analysis. Alternative dispute resolution options, including mediation, are often available in civil claims. I could write entire posts critiquing or supporting use of ADR and aboriginal claims (I mean, there was that experiment with the ICC), but I’ve never heard of anyone actually trying (not that I’ve been looking). This case may help explain why its rare to hear about mediation in the context of civil claims. Here, Matsqui served the Crown with a Notice to mediate. The Crown came back with an application for a court order to be excused from a mediation process. What I find so interesting about this case is that the rules require attendance of a “representative who must “have full authority to settle, or have access at the earliest practicable opportunity to a person who has … full authority to settle, on behalf of that participant”.” (paragraph 8, citing the BC Notice to Mediate (General) Regulation. The Court’s decision was pretty straightforward. One may only be excused on a standard of ‘material impractibility’. The Court notes a similar test in the Alberta rules, Alberta caselaw on those rules and a BC government website to identify criteria for material impractibility and rules the mediation should proceed, effectively dismissing the Crown’s primary arguments. What I find interesting here is less the Court’s decision (which was pretty straightforward in my view), but the Crown’s arguments. The last argument is the most irritating to me, but let’s take them one at a time. On the first point, it’s far from clear whether this a test case or not. We can thank 30 years of aboriginal rights jurisprudence for cementing site and species specificity to the point where any case could be considered a test case. In any event, I’m not sure why the precedential value of claim means it can’t be mediated. In fact, it strikes me that Matsqui would likely have more to gain from a precedent than the Crown. The Crown certainly suggests that such novel claims can’t be negotiated. Which, given the site and species specificity criteria noted above, means one should expect the Crown to litigate every aboriginal case, rather than seriously exploration negotiation or settlement options. The second point is pretty telling for BC First Nations. I’m actually startled to read it, mainly because I’ve been looking closely at one of the Kwicksutaineuk (http://canlii.ca/t/frv2c) case this summer. In that case, the Crown actually relied on its mandate to deal with aboriginal rights claims to support a consultation process on aquaculture regulations. DFO is regularly in court with First Nations, but apparently lacks the authority to settle such claims? Seems like some very fine splitting of hairs to me. DFO can certainly infringe aboriginal rights (see Sparrow) and it can accommodate unresolved aboriginal claims (see Kwicksutaineuk), but it can’t settle them? I guess that how things like this (http://www.hashilthsa.com/news/2013-03-15/dfo-continues-frustrate-ahousaht-will-fish-declares-tyee-maquinna) happen. Moreover, I’m shocked the Crown had the guts to actually argue this. The case is styled Matsqui v. Canada (Attorney General). That’s not some kind of accident. The Crown’s obligations are not represented piecemeal by different departments, but by one entity, the Attorney General, in Court. As I say above, this is splitting hairs, but man, it’s splitting them really fine. I’m not so outraged about this argument, but I think its pretty foreboding for any First Nation dealing with DFO. What I am outraged about is the third argument. This decision was released on August 7, 2015. A federal election was called on Sunday, August 1. Some the text in this article caught my eye (http://www.theglobeandmail.com/news/politics/harper-promises-apprenticeship-tax-credit-if-conservatives-re-elected/article25816853/) – the existence of a government memo, allegedly released August 2, which outlines what the government can and can’t do during an election. It’s a brief memo and well worth reading. As I read it, I don’t see anything which would prohibit ongoing negotiations to settle aboriginal rights claims (particularly where settlement of those claims are likely in the public interest, are probably pretty routine – since the government, though apparently not DFO, is involved in all kinds of negotiation with aboriginal peoples). What’s outrageous is that unless arguments occurred the Sunday the election was called (this memo was apparently released the next business day, according to the Globe and Mail), the Crown was making arguments about government policy that directly contradicted a policy statement (assuming the policy statement I offer is actually legitimate). Thankfully, the court was unpersuaded by these arguments – instead opting to school the Parties (and myself, for that matter) on mediation, blogged about over here: http://rulelaw.blogspot.ca/2015/08/mediation.html. It’s a good thing because in my view, there’s a pretty good case to be made that the Crown may have misled the Court (I suspect it was inadvertent) and at the very least adopted a position in court which is adverse to current government policy. I should point out I really feel for the Crown counsel who argued this case. I strongly suspect the lawyer didn’t even know about that memorandum. It’s not exactly easy to find, and I wouldn’t have looked myself, but for the Globe and Mail’s reporting (in fact, I would assume everything stops for an election). It’s also true this ground was not at all central to the Crown’s arguments. At the same time, these arguments highlight that the Crown perceives aboriginal disputes to have a fairly substantive political element – clearly one that lies beyond the reach of DFO. It also highlights, once again in my mind (look how long it takes to negotiate treaties and claims agreements versus international treaties), the extreme difficulties of negotiation to resolve disputes surrounding aboriginal rights. My last post was about the Thunderchild case – a case which holds that even if First Nations were financially self-sufficient, failure to agree to any terms and conditions (and funding) from the government of Canada would result in third party management. It’s an odd finding, since the power to place a First Nation in third party management usually arises from a contract between that First Nation and the Crown. Thunderchild First Nation protested terms within its funding agreement it didn’t agree with by failing to sign the funding agreement. The Federal Court held that even in absence of a contract, the government of Canada has the power to impose third party management on a First Nation. This post is about a possible strategy First Nations, even those currently in third party management or co-management, might consider in order to mitigate the impacts of third party management. Many First Nations complain, rightfully, that being placed in third party management removes a substantial amount of decision making from the First Nation council and places that control in the hands of an administrator, often remote from the community, which is not accountable to the community. It’s a pretty simple strategy, actually, but before I go there, it’d be helpful to provide some clarity about third-party management and its relationship to governance. Third party management is less about governance in the context of self-government and law-making and more about governance in the context of administration. This is important because many important decisions at the community level are essentially administrative in nature. Moreover, many of those decisions are left to the discretion of the First Nation. Those decisions, even if discretionary in nature, must still be consistent with the law. A consolidated funding arrangement provides funding, and includes terms and conditions on how that funding is to be administered. However, funding arrangements are not exhaustive, particularly where the terms and conditions of program and service delivery on reserve are concerned. For example, First Nations cannot discriminate in the delivery of programs and services (for example, by engaging in gender discrimination, http://canlii.ca/t/ghf8b). I would suggest that the terms and conditions of a consolidated funding agreement couldn’t violate, or be interpreted and applied to violate, say, the Canadian Human Rights Act. The same could be said for any other number of federal laws and regulations. It really doesn’t matter whether the party responsible for administering the program or service is a third party administrator or a First Nation government. There is another source of potential laws which could seriously reduce the discretion provided to administrators of First Nations funding – First Nations by-laws developed under s.81 of the Indian Act. I wrote an earlier post (http://reconciliationproject.ca/2012/10/31/bill-c-428/) on a private member’s bill to repeal section 82 of the Act (which gave the Minister a veto over First Nations laws). I can say now that I was dead wrong and my concerns about the s. 81 repeal (that the Crown would reinsert the Minister’s veto power) were apparently unfounded. This might be very good news for First Nations finding themselves in third-party or co-management situations. It’s helpful at this point to stress that third party management relates only to administration of First Nations government operations. It doesn’t strip First Nations of law-making authority. Until the repeal of s. 82, that would’ve been an insignificant distinction, since the Minister was able to effectively prevent any First Nations from exercising law-making authority. With the repeal of s. 82, the distinction becomes critical. While First Nations in third party may not be able to control administration of programs and funding, they are able to pass s. 81 by-laws. There is nothing preventing a First Nation in third party, particularly one such as Thunderchild, from passing First Nation laws which require certain conduct from First Nations programs. Indeed, a legislative (or even regulatory) base for programs, services and operations while rare on First Nations issues, is not uncommon at all in social, economic or environmental policy. When I first thought of this tactic, I was thinking about laws which would require some minimum level of service for programs and services. Alternatively, I was wondering about laws and regulations which would govern the conduct of administration in dealing with programs and services (how the housing list is maintained for example). The simplest and most brazen law would be one which requires First Nations Administration (whether controlled by the First Nation or not) to seek the consent of the Council prior to making changes in how programs and services are delivered. Me, I’m not a big fan of that one for two reasons. First being its too brazen for me. I don’t think it’s particularly helpful for First Nations to try to use laws to directly circumvent contract terms which they themselves have already agreed to (this is why Thunderchild presents a good test case for this strategy – it disagreed with the terms). The same holds true for service delivery: I don’t think a First Nation law, mandating no boil water orders in the next 5 years would be particularly helpful. Mainly because the law would be applicable to the First Nation (not the funder). A law could state; however, that the First Nation’s public works department has to allocate its resources based on need (need defined by the technicians, by established criteria or both). Second, if you step back and think about it, First Nations laws on administration offer First Nations an opportunity to divorce administration (programs, services and benefits for individuals or sub-communities) from more legislative and political aspects of governance. A very long time ago, I took a course on Nation Building with these guys, and it struck me that its generally a very good idea to remove politics from business development and administration of programs and services (ie – that these should be managed independent of Council, but should be accountable to Council). This already happens for almost all First Nations, the existence of a law really just formalizes the arrangement. In fact, I believe there are several First Nations which don’t rely on government funding and which do use independent authorities (which many First Nations do) for delivery of programs and services. Using laws to govern that relationship might be redundant for these First Nations from a governance standpoint, but would nonetheless be helpful in terms of reducing the amount of control the government imposes on them through providing funding to those independent bodies. Moreover, I find that Chiefs already have enough to worry about in terms of managing ‘political’ issues – negotiations with the government, legislative issues and responding to concerns from their constituencies. It’s a lot to ask to add the need for detailed knowledge of departmental funding policies, program and services criteria, human resources issues, etc. Such separation would also definitely remove the sting of third party management, especially for First Nations such as Thunderchild, who’s great crime appears to be they are unwilling to enter into contracts that they find unacceptable – and are simply unwilling to accept government funding at any cost. Further development of First Nations laws provides a means for increased control over programs and services on reserve and could serve as a counterbalance to the apparent tyranny (I don’t have experience with them, but it sounds pretty bad to me) of operating under existing funding arrangements. It also provides a means for First Nations to formalize what for many are likely existing accountability mechanisms for administration, to regulate the conduct of administration and to formally separate administration of funding, program and service delivery, and leadership. It does not decolonize First Nations governments. In fact, this strategy uses what for many is a colonial instrument, the Indian Act, in order to exert more control over how programs and services are delivered – to counterbalance the unsavory terms of funding agreements. Finally, such laws would need to be carefully drafted and could pose implementation challenges – particularly if the intent is to compel greater funding (an outcome I find extremely unlikely, at least based on the strength of such a law alone). I do hope to have a series on Tsilhqot’in and on Keewatin – two monster cases from last year. In addition, the extremely well-argued Tlicho case, regarding the creation of a ‘superboard’ in the NWT, is looking to be a humdinger. But before that, here’s a ridiculous case. The case is Thunderchild First Nation v. Canada (http://www.canlii.org/en/ca/fct/doc/2015/2015fc200/2015fc200.html). There really isn’t much to write about Thunderchild, which is one reason I’ll use this case to ease back into this blog. At the outset, this case represents one of the gutsiest moves I’ve ever seen by a Chief and Council. In essence, this case holds that First Nations can either agree to terms imposed by the federal government in funding agreements or the government will simply take over their operations and presumably impose those very same conditions. It’s an extremely bizarre decision and it suggests that Courts are increasingly hostile to First Nations control of First Nations communities. At issue in this case is a decision by Aboriginal Affairs and Northern Development to place a First Nation into Third Party Management. You get the sense that the terms and conditions for these agreements aren’t really up for any meaningful negotiation. After all, Thunderchild FN did suggest an interim funding agreement, while negotiations proceeded on its concerns, a proposal which was rejected by AANDC. It’s also true that the excessive amount of government funding, and the agreements which transfer that funding, are the primary means of government control of the activities of First Nations governments (as opposed to, say, legislation and regulation). This means that successive governments can champion a veneer of self-government for First Nations, while at the same time exerting excessive control over community operations through contract. This is one reason why the language in the Attawapiskat case regarding the Honour of the Crown and funding agreements is so critical. So, Chief and Council at Thunderchild First Nation said, ‘enough is enough’ and refused to sign their funding agreement. You would think that First Nations would be free to decline funding from the federal government. You would also think that the government, particularly one dominated by a political party which appears to oppose ‘big government socialism’ would be happy to see First Nations off of government funding. You’d be dead wrong. In the Attawapiskat case, the issue was whether a Third Party management clause within the funding agreement itself could be invoked. But here, there is no funding agreement. What was the basis for the federal government to effectively seize control of a First Nation’s government’s operations? That they didn’t sign a funding agreement with the federal government. The basis for this finding is something known (to some, I guess) as Directive 210 – Third Party Agreement Management Directive. I work in this area, and even I had to go look this one up. To be honest, I thought this would be a case of a court selectively cherry-picking language out of a policy document. But I’m not sure that’s the case. To provide for the timely and effective remedy of high risk Defaults, where the Recipient is assessed by the Department as being unwilling and/or unable to rectify its default situation and only when deemed by the Department to be necessary, by engaging a Third Party Funding Agreement Manager to administer the terms and conditions of the funding agreement signed by the Department – for a period of time during which the Recipient works to remedy the underlying causes of the Defaults and reassume administration of funding. The Directive sets out Third Party Funding Agreement Management as an administrative response appropriate in the event of high risk Defaults involving a First Nation, Tribal Council and Other Aboriginal Recipient providing essential services; or the funding agreement that would normally exist with these Recipients is not in place. This leads the court to conclude (at para 5) that “AANDC’s internal policy contemplates a TPFAM when no funding agreement is in place, even in the absence of default.” That’s a fairly reasonable conclusion to be drawn from a fairly bizarre policy statement. Think about it. If a FIrst Nation ends up in Third Party Management under this policy, the only way out is “to remedy the underlying causes of the default”. But if the First Nation didn’t sign a funding agreement, and hence isn’t in default, then they are incapable of doing so! If you think that is a rigid and technical way of reading the policy directive, then consider the government presumably asked the Court to place Thunderchild First Nation in Third Party Management on the strength of those 15 words in section 4 of the Directive. This should be an incredibly difficult decision to swallow for First Nations governments. For some, their choice is clear – either agree to funding agreements with such harsh conditions that they seriously risk default (and third party management); or, request negotiation of terms, only to be rejected by AANDC and move immediately into Third Party Management. This case ultimately demonstrates the extreme power imbalance between AANDC and First Nations, particularly where funding is concerned. While most of the decision focused on administrative law issues, the court gave very short shrift to the Honour of the Crown. To be fair, it appears possible that Thunderchild First Nation may only have raised Honour of the Crown in terms of duty to consult and accommodate. I would think that the Honour of the Crown might require a distinct duty where funding arrangements for critical programs and services are needed. Even if I’m wrong though, the single paragraph the Court devoted to the duty to consult was perfunctory. It bizarrely focused on the Wawatie case (http://canlii.ca/t/237vn) – a case about whether or not the duty to consult applies in the context of leadership selection. In my view, the court conflated ‘self-government’ in terms of leadership selection and administration of programs and services. Not only that, the court ignored the more recent Attawapiskat case, which held exactly the opposite – namely that the Honour of the Crown does apply in the context of funding agreements. While, again, there is no funding agreement here – the reason there is no funding agreement is because AANDC refused to enter an interim agreement to provide essential programs and services, instead relying on its own internal policies to seize control of the First Nation’s administration. That doesn’t seem like ‘good faith’ negotiation – and it doesn’t seem like honourable conduct. It looks to me like a simple case of extortion. I have been gone for quite some time. In my absence the Supreme Court issued two major, and in my mind thoughtful, decisions in both the Tsilhqot’in and Grassy Narrows case. While I would love to delve further into these cases, I first wanted to issue a post on why rights discourse is important. For some reason, I am often confronted by those who suggest my proclivity for rights-based arguments is unreasonable – that there are ‘many problems’ facing First Nations (and indigenous peoples more broadly), and that everyone’s efforts should be focused mainly on poverty alleviation as a first step, rather than ‘esoteric’ rights advocacy. This post is about why rights matter. It’s a pretty incomplete argument. I don’t think that anyone denies that indigenous peoples face a multitude of economic and social challenges – those that do can be confronted with volumes of statistics articulating the ‘gap’ between indigenous peoples and non-indigenous peoples in Canada. Even more shocking to me is the data gap itself – in many cases, there isn’t even data on social or economic conditions of aboriginal peoples to compare to the general population. The government response to the identification of such gaps is often to stress the supposed truckloads of money expended on the welfare of aboriginal peoples. Increasingly, advocates are challenging these representations by comparing funding for services for aboriginal persons, as opposed to amounts of funding provided to the general population. Perhaps not surprisingly, as there is a gap in outcome, so too there is a gap in funding for programs (particularly infrastructure, child and family services and education). Working in aboriginal advocacy, one common refrain I hear from government is that although a tremendous gap exists, and although there may (no good government rep would acknowledge discriminatory treatment in funding) be some funding disparities, ‘we all know that money won’t solve everything’. I’ve even been told that ‘money won’t solve anything’. I don’t necessarily disagree, I don’t think money solves everything. The government is in the business of printing it. If money solved everything and if government actually cared at all about indigenous peoples (which I think it does), then it could simply print more and more money to resolve those problems (setting aside minor issues regarding inflation and money supply, etc). What’s the point of having money if you can’t spend it? Or alternatively, what’s the point of having money if you can only spend it they way someone else tells you to spend it? That’s the real issue that rights advocacy addresses: control. While focusing on economic development is great, in absence of any sense of indigenous control of indigenous resources or economies, all of those gains are remarkably vulnerable to taxation (believe it or not), government regulation or government interference. The issue isn’t only about inadequate resources, its about inadequate control. That’s not just in the present, but can be an ongoing concern. For example, if a particular business model results in prosperity for indigenous businesses, it is often the case that the government will intervene, quickly and harshly, to ‘regulate’ that ‘industry’. To some extent, this is what occurred with the proliferation of casinos in the United States (in my mind, an already dubious economic proposition). In Canada, government efforts to regulate on-reserve cigarette production has moved beyond economic regulation and taxation to outright criminalization of the industry. I can only imagine how much those involved in the First Nations cigarette industry have an appreciation for rights discourse. They have witnessed the impact of government reaction to indigenous prosperity. This government repealed a longstanding exemption of the Indian Act from scrutiny under the Canadian Human Rights Act. Want to guess what the first case heard by the Canadian Human Rights Tribunal involved? It didn’t have anything to do with gender discrimination, housing lists, access to services or even any operation of a First Nation government. It had to do with Economic Development. The Beattie complaint (http://canlii.ca/t/2fgnd) involved a pretty unreasonable and inexplicable interference in the business affairs of a First Nations businessperson. The problem, so far as I could tell, is that because a proposed lease transaction was beyond the understanding of a government employee, the government refused to approve the transaction (as required under the Indian Act). The Canadian Human Rights Tribunal, invoking the human rights of the complainant, required the Department to reconsider the lease and to substantially reform its policy for approving leases. In other words, if someone holds an on-reserve property interest (which is presumably worth something), they should be free to manage that interest how they want, particularly when it comes to entering into commercial transactions. Rights advocacy is important because it allows indigenous peoples a vehicle to seize control of our economic, environmental, social and cultural futures. Rather than focussing on creating incentives for other parties (business, government, NGOs) to support indigenous aspirations, rights advocacy is about shifting power to those who already have the strongest incentives to improve the lives of indigenous peoples – indigenous peoples themselves.